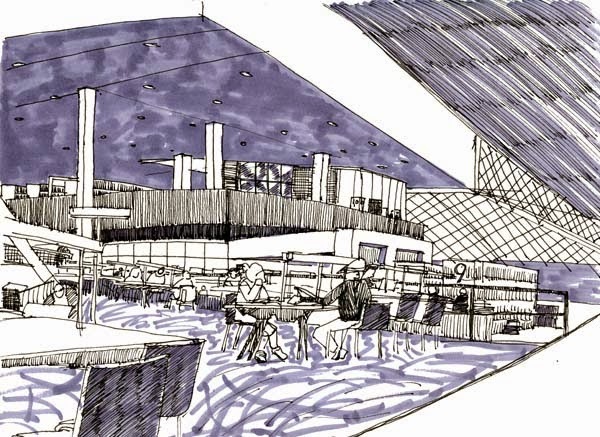 It had been a while since I sketched at the Seattle Central Library. On top of that the cold winter weather is making sketching outside increasingly unpleasant. So I packed up my notebook and headed downtown. I could not find parking on the street and parked in the library parking garage off of Spring street. This meant I had a brief time to sketch before the parking fee shot through the roof. I decided to head up to the reading room, which is my favorite area in the library. I always feel so light in this space cantilevered over the street below. The space is also visually striking with the massive cube that houses the library's offices hanging over head. I hope to get out and do some more sketches soon. Great sketch, Logan...I love the combination of markers.